Ahhh I love holidays and having people around to cook for! In the past few months I have been lucky enough to be given several baking cookbooks, one of them being 'Best of Pierre Herme.' It's a fabulous book full of very challenging recipes, with the greatest challenge being that they are all in French! 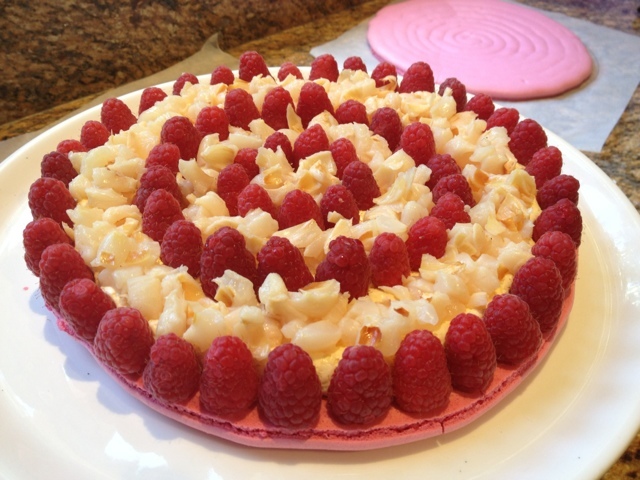 Tonight I tried out the easiest recipe in the book, and Herme's signature - the ispahan. 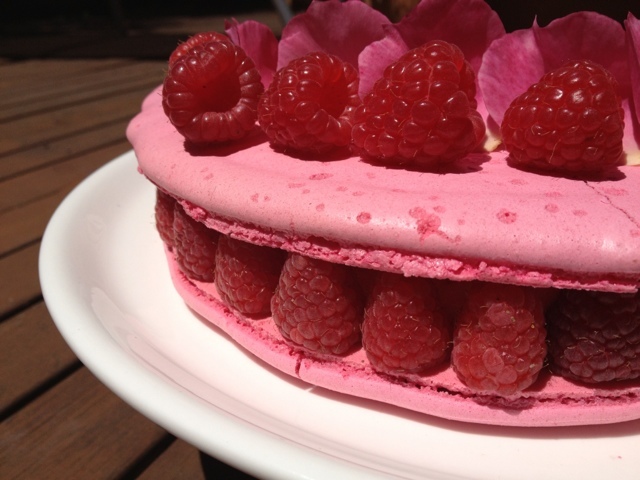 Ispahan is a gigantic macaron filled with fresh raspberries, lychees and rose buttercream. This combination of flavours has been recreated in many desserts on restaurant menus and in other cookbooks. One of the other books I receieved, Sweet Studio by Darren Purchese has a dessert with the same flavour profile. 1. My macaron shell on the top cracked. Either because it was undercooked or because my raspberry layer underneath was too uneven. 2. I left the finished dessert under the window whilst Dad pressure sprayed the outside of the house. Who knew our windows were so leaky? The result was a very speckled dessert from the water spray! Oh well! It just shows i'm not perfect! So for the recipe. Here is a translated version. It is my translation so I accept no responsibility if I have made mistakes! Having said that it worked for me! There seemed to be a lot of mixture - I ended up making 22 macarons with leftover mixture and filled them with leftover rose buttercream and had extra buttercream left over. I think there was probably enough mixture to make another whole Ispahan! Place almond meal and icing sugar in a food processor andpulse until combined. Sift mixture into a medium-sized bowl. 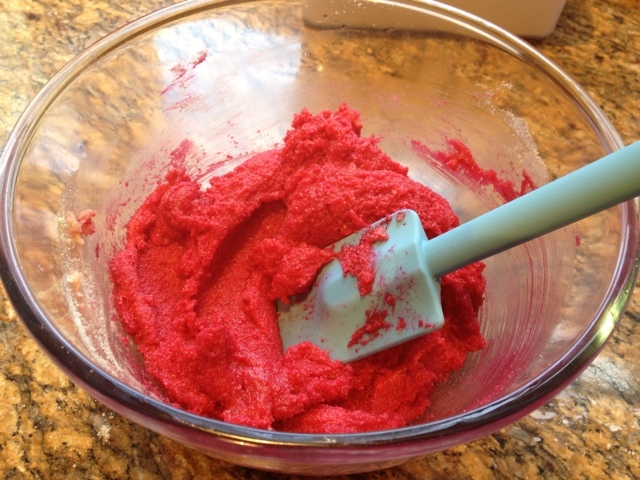 Add the food colouring into 3 egg whites, add to almond mealmixture and stir to combine. Place the extra 3 egg whites into the bowl of a stand mixer. You need to ensure the almond paste is bright pink like this, otherwise it will become too pale when the egg whites are added. In a small saucepan add the caster sugar and water. Heat ona medium heat until it reaches 110 degrees. Turn stand mixer to high to whipegg whites. When the syrup reaches 118 degrees, remove it from the heat andpour onto the whipped egg whites, in a slow, steady stream. Keep whipping the egg whites until it becomes thick andglossy and reaches approximately 50 degrees. Add approximately 1/3 egg white mixture to the almond mealpaste. Stir to incorporate and loosen the mixture. Fold in the remainder of theegg whites. Place the mixture in a piping bag fitted with a #12 tip*.Line 1-2 trays with non-stick baking paper or a silpat and pipe 2 20cm discs,starting from the centre and working outwards. The discs resting on the bench. 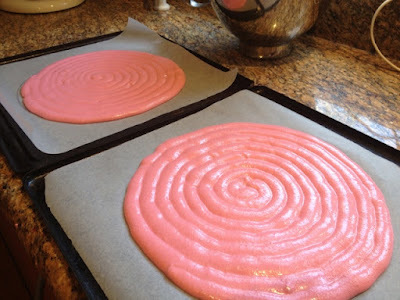 Place the macaron discs in the oven and bake for 20-25minutes or until cooked. Remove from oven and leave to cool. *I only have a size 9 tip which worked ok.
Whisk together the egg yolks and sugar in a medium bowl.Place the milk in a small saucepan, bring to the boil then pour over the eggyolk mixture. Whisk to incorporate then pour the mixture back into thesaucepan. Heat on a low heat until mixture reaches 85 degrees (be careful notto let the mixture stick to bottom of the saucepan.) Pour mixture into the bowlof a stand mixer and whip on high to cool mixture. Pour into a bowl and placein the fridge to continue to cool. Place the butter into the bowl of the stand mixer (don’tworry about cleaning it.) Using the paddle, beat butter until soft and creamy.Pour in cooled crème anglaise mixture (the one you just put in the fridge) andbeat to combine. (If it curdles keep beating!) Using the lowest speed, or by hand, fold through the Italianmeringue and both the rose essence and syrup. Transfer into a piping bags witha #10 tip, ready to use quickly. 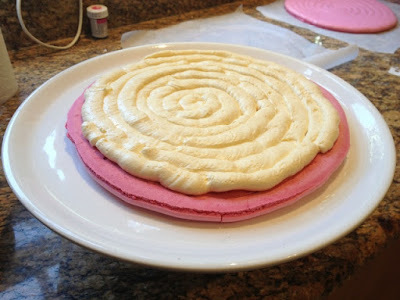 Place the second macaron disc on top, with the flat sidedown. Decorate the top of the macaron with 3 fresh raspberries and5 rose petals, ‘gluing’ the decorations down with a dab of glucose. Don't leave uncovered under a window where it can get wet!!! Leave in the fridge and bring to room temperature before serving.